“No one has greater love than this, to lay down one’s life for one’s friends” (Jn 15:13). That’s the overarching theme of Faith of Our Fathers (Pure Flix), a well-intentioned but awkwardly uneven account of Christianity’s impact on two generations of families. Director Carey Scott can’t seem to decide whether his film is a serious drama or a slapstick comedy. Still, a faith-promoting message of an evangelical stripe pervades the proceedings – no bad thing these days, especially for adolescents who are more usually bombarded with secular narcissism. In 1997 California, John Paul George (Kevin Downes) – whose Beatles-evoking name the script treats as a running joke – is a humble, God-fearing postman who’s preparing to marry his fiancée, Cynthia (Candace Cameron Bure). While cleaning out the garage, John Paul discovers a box of military items that had belonged to his late father Steven (Sean McGowan). In circumstances that remain unclear to John Paul, Steven was killed in Vietnam just after his son’s birth. Intrigued by a letter about Steven’s platoon mate Eddie (Scott Whyte), John Paul sets out to find his dad’s erstwhile comrade, and learn the truth about his death. The search brings him to Mississippi, where he encounters Eddie’s hillbilly son, Wayne (David AR White: also a co-writer along with Downes and Harold Uhl). Like Steven, Eddie, it turns out, perished in combat. As for Eddie’s ornery offspring, the shotgun Wayne brandishes makes it obvious that he’s none too happy to see this uninvited stranger. “You’re not a Jesus freak, are ya?” Wayne loudly demands. Needless to say, the boy has issues and zero interest in resurrecting the past. But John Paul is insistent, and an improbable bargain is struck. 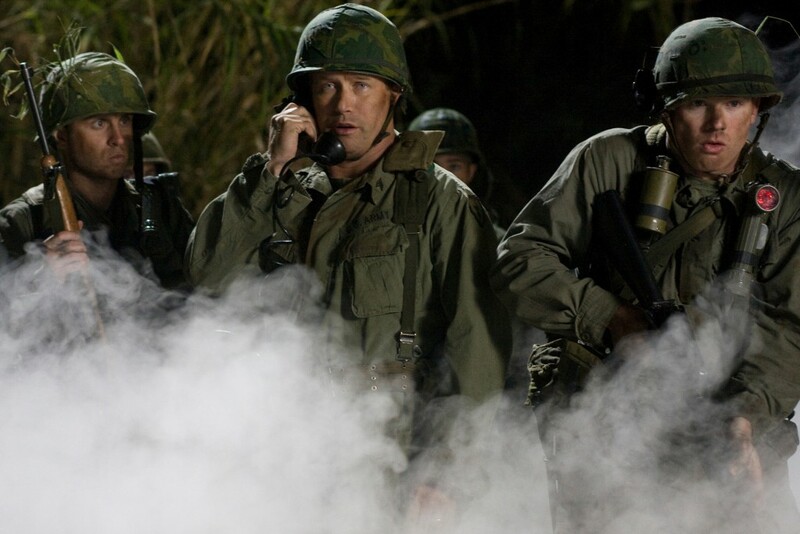 In exchange for access to Eddie’s letters, John Paul agrees to accompany Wayne on a trip to Washington to visit the Vietnam Veterans Memorial and seek “closure”. Faith of Our Fathers morphs into a spiritual version of Thelma and Louise as this odd couple gets into all sorts of trouble on the road while debating big-ticket topics like forgiveness and destiny. As they bond, flashbacks recall the friendship shared by their fathers, forged in harm’s way. The earlier duo, it seems, were also oil and water: Steven, pious and Bible-reading; Eddie, a master of ridicule. Slowly, we’re shown, Steven’s sincerity won Eddie over – and the whole platoon with him. Even the sceptical Sgt Mansfield (Stephen Baldwin) came around, later telling John Paul, “Your father taught me that men don’t have to die when they die”. Despite sentimental dialogue and contrived situations, Faith of Our Fathers deserves some credit for its godly and patriotic outlook.